Tom Hamilton is only in his mid-'20s, but the guitarist/singer commands his nursery of American Babies with all the seasoned know-how of someone twice his age. The band is filled out by some heavy hitting Brooklyn based musicians; guitarist Scott Metzger, bassist Jim Hamilton, vibraphone virtuoso Kevin Kendrick, and the highly praised drummer Joe Russo. 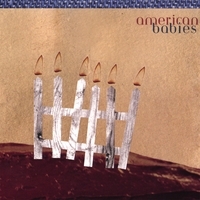 Such a lineup could easily create a large, boisterous sound, but the American Babies apply a "less is more" mentality to these rootsy, country-infused tunes. When Hamilton strums his guitar, casually wails into his harmonica, and leads the American Babies in another one of their wistful numbers, he channels a young Gram Parsons (or perhaps a more sober Ryan Adams). And when the American Babies wrap their three-part harmonies around Hamilton's twangy baritone, it's not hard to see this group - and their young leader - enjoying a career as lengthy as those aforementioned luminaries.